This is a great race with a strong cult-like following. You line up at 6:01 and basically run about a 5k distance that is flat with a few minor elevation changes and you pass very close to the starting line again before starting the descent – part of which is packed dirt and gravel but the majority is pavement. You finish running through the town of Old Fort. There are rooms available at Ridgecrest and I found that to be a very good idea. You’re right there by the starting line when you wake up and you have a place to shower afterward. The annual 1/2 marathon will run from Ridgecrest to Old Fort. 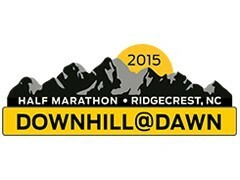 You will experience some absolutely incredible views on this Downhill@Dawn Half Marathon. The wooded mountains are majestic. You will pass some beautiful streams and rivers and The Old Geyser park. Race Packet: Pick up your race packets (whether you stay on campus or not) is Friday afternoon 3pm – 8pm or Saturday morning 4:30am – 5:45am in The ARC on the Ridgecrest Campus. We recommend runners pick up their own packet. Those requesting to pick up another’s packet will be required to sign a form verifying receipt. Pre-Race Information: Check-in for rooms at Pritchell Hall beginning at 3pm on Friday. Race Day: The race will start at 6:01am on Saturday, June 6, 2015 from Royal Gorge, between the Royal Gorge Apartments and the Maple hotel. There is on-campus parking (secure) for those staying off campus. The simplest parking is near Woodland (building on campus) the ARC and parking near the start of the race in Royal Gorge. At the finish line water, bananas and bagels will be available. Shuttles will provide transportation back to Ridgecrest after the race every 15-30 minutes as needed.